Garmin International Inc. announced today the Garmin Marine Network, a fully-integrated, plug-and-play system that puts GPS, weather, sonar, radar, and other important data literally at a boater’s fingertips. There will initially be two units that feature this new service, the GPSMAP® 3010C and GPSMAP 3006C. The two multifunction displays (MFDs) show data in a user-configurable format. You won’t need to mount these units away from the elements because they are waterproof and feature a sunlight readable, 256-color, 640×480-pixel VGA display in either a 10.4″ or 6.4″ diagonal screen size. The MFDs are powered by a high-speed processor and graphics controller for fast redraw of charts and weather graphics. 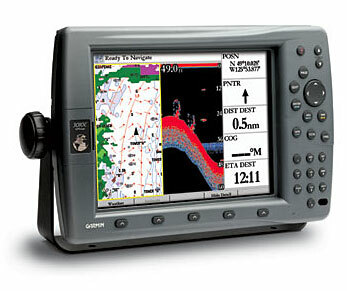 A unique feature to the Garmin Marine Network is the addition of the GDL™ 30 weather data receiver. Through a partnership with the XM WX Satellite Weather data service, mariners for the first time can access real-time graphical weather data directly on the GPSMAP 3010C or 3006C — without the need for a separate PC interface. The XM WX Satellite Weather data service will cost about $50/mo (other tiers available to suit your needs) and a fully equipped system can cost up to $4000. This XM stuff is starting to look very compelling!